Potential and declared candidates are lining up to replace Troy Fraser in Senate District 24. The potential field to replace state Sen. Troy Fraser is taking shape, signaling yet another crowded primary for a seat formerly held by a veteran lawmaker. The Horsehoe Bay Republican announced he was not seeking re-election the day after the legislative session ended earlier this month, officially leaving open the Central Texas seat he first won nearly 20 years ago. 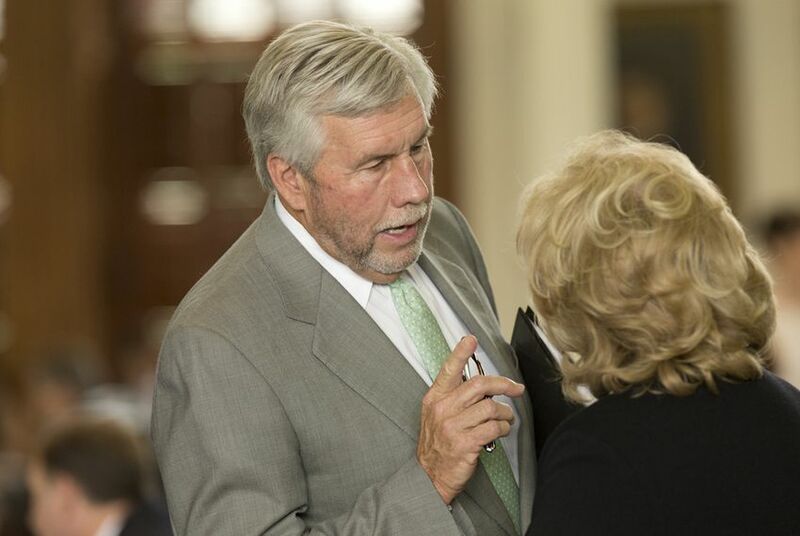 The latest development came Wednesday from state Rep. Paul Workman, an Austin Republican considered a potential contender for SD-24. Workman said he would not seek the seat and instead run for re-election to the House. Earlier Wednesday, former San Antonio City Councilman Reed Williams said he was considering a run for the seat and was in the process of traveling the district and gathering input from constituents. Williams, now a San Antonio Water System trustee, said he would not make a decision until after July 4. And a day earlier, another GOP lawmaker — state Rep. Susan King of Abilene — indicated she was considering a run for the seat. "At this time, I am committed to run for re-election to the Texas House," she said in a statement. "However, I am taking a serious look at the Senate District 24 seat and will make that decision soon." Austin ophthalmologist Dawn Buckingham has already thrown her hat in the ring, announcing her candidacy the day after Fraser said he was stepping down. Buckingham is already familiar around the Capitol as an active member of the Texas Medical Association. Voters in SD-24 will likely have no shortage of choices by the time the November filing deadline rolls around. The district covers a large swath of Central Texas, stretching from northwest of San Antonio through the Hill Country up to Abilene. The Senate district touches several House districts, including those of GOP Reps. Andrew Murr of Junction, J.D. Sheffield of Gatesville and Molly White of Belton. Murr's office said Wednesday he was not interested in Fraser's seat — and likely not eligible due to where he lives. Sheffield, who already has a primary challenger, plans to run for re-election and "run hard," according to his consultant, Jerod Patterson. And White has yet to officially comment on the race. Other people who have been encouraged to run include Shea Woodard Hall, a Texas-based staffer for U.S. Sen. Ted Cruz, and Abilene Mayor Norman Archibald. Woodard Hall, who handles West Texas outreach for Cruz, said Thursday she was not interested in the seat, while Archibald is not saying either way. "As of now I am pleased to be serving as the Mayor of Abilene," he wrote in an email Friday. "Thanks for asking."